Each team has a shared life total that starts at 30 life. Each team takes their turn together, meaning they draw as a team, attack as a team, block as a team, and go through all phases of the turn as a team. The team that goes first skips their first draw step. Teams do NOT share any resources other than life--meaning players can't share cards in hand or mana. The short way of remembering this is any reference to "you" on cards still means each individual player. Each player can block any creatures that are attacking them, their teammate, or any planeswalker their team controls. Teams may share information and strategize together. The first mulligan is to seven cards, then each mulligan afterward results in one fewer card (six, five, four etc.). A teams loses when their life total is 0 or less, when they accumulate fifteen or more poison counters, or when either team member is unable to draw a card from their deck. Damage and loss of life happens to individual players, and the effects are applied to the team's shared life total. The same is true of gaining life. For example, if one player gains life, the team’s life total goes up, but only one player’s “whenever you gain life” effect triggers. Effects that read "each opponent" or "each player" affect each team member separately. For example, when Rabid Bloodsucker enters the battlefield, each player would lose 2 life—meaning each team loses 4 total life. 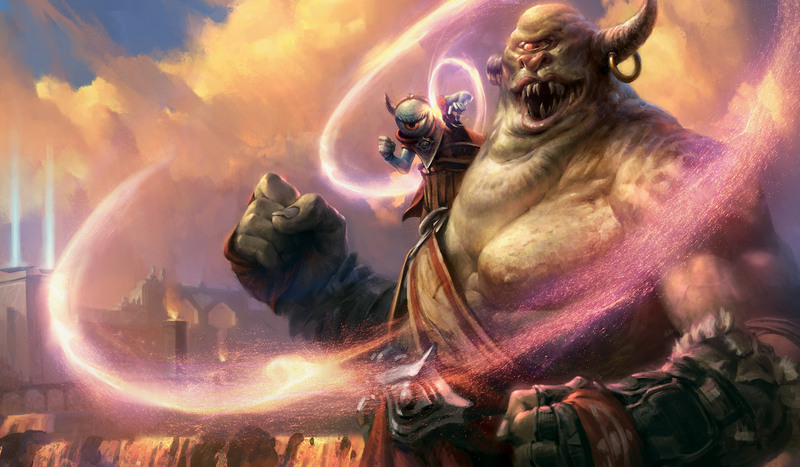 In Constructed, Two-Headed Giant has unified Constructed rules. This means that across the two decks, only four copies of any non-basic land card are allowed to be shared between them. In Limited, Two-Headed Giant games share a card pool. Players pool the cards they open and build decks together. For more information on rules and formats, check out our Rules and Formats page.